UPDATE: 7/29/2014 Additional photos of the damage were posted to the Rauh-Welt Begriff facebook page, along with a short statement. It was dropped when I take down with a circuit crane. It is responsibility of the circuit. The Idlers 12 Hour race at the Twin Ring Motegi in Japan is quite an interesting event, being that it is an endurance race held largely for amateurs from all over the world in a variety of cars. It has always been, and remains, a favorite of Mr. RWB, Nakai San himself, and as such, he organizes several of the cars he builds to run the event every year. A number of Rauh-Welt Porsche cars are transported in for them to drive. Mark Arcenal, of Fatlace and illest fame, has worked with Akira Nakai on a few of the RWB creations, and this year decided that he would join in on the fun. Mark had just gotten out of his race car on pit lane when he saw the unfortunate visuals below. According to Mark, as he was coming in to the pits, he saw the silver RWB up on a crane's cable, being unloaded from the flat bed that it was trailered in on. 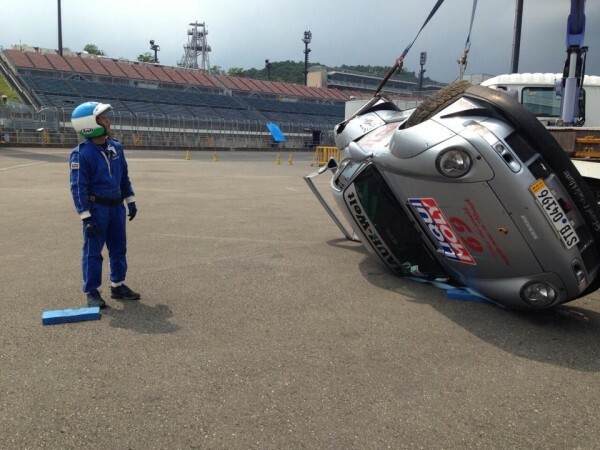 After he had gotten out of the car and removed his helmet, Mark then noticed that the car was lying on its side after having been unceremoniously dumped there by the crane operator. Apparently, according to Mark, "it got hit from behind then slammed into the wall. 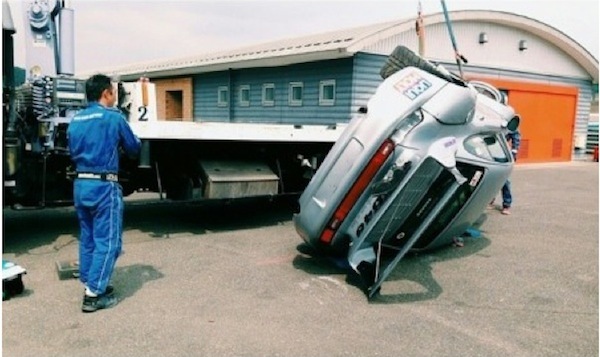 The tow driver picked it up then the straps broke putting it on its side." It's possible Arcenal's assessment of "totalled" might be a bit premature, as most of the damage appears to be cosmetic. However, given the fact it got "slammed into the wall" you never know. Chances are high that the Porsche, once righted, will run and drive exactly as it had prior to the mishap. Once the body damage has been repaired, it stands to reason that the car would be exactly as it was before, a masterpiece on wheels. I seriously doubt there will be insurance on this. Either the circuit will pay or the owner.